Are you ready for an uncluttered career? The immersed career. A career that you love with a deep passion, surrounded by great colleagues who support and believe in a similar vision, and that is an integral part and reflection of who you are. Your career and your personal life bleed into each other, happily. The detached job. A job that has regular hours, no demands on your time beyond your scheduled work day, generates enough income for a comfortable lifestyle, great colleagues, and a positive corporate culture. You clock in, do your job, have no major complaints about being at work, clock out, and rarely think about work when you’re not there. Other types of jobs lend themselves to creating frustration, unproductive stress, and disappointment. If you are immersed in a career with people you can’t stand, you’ll be miserable. If you’re in a detached job but have a boss that calls you on your free time expecting you to drop everything and come back to the office, you’ll be resentful. And, in case it isn’t obvious, I’m of the belief that misery, resentment, frustration, and unproductive stress are clutter. If your job is clutter, financial circumstances might make quitting it difficult, especially if you’re in a part of the world where lining up a new job is very difficult. If your career is clutter, you have the financial aspects to consider, as well as quitting can leave you feeling like you’re cutting off a part of yourself. For many people, though, the clutter of a bad job or career may be too much and worth quitting and taking the risks of something new. If you’re wanting to leave your current employer and looking to have an immersed career, I strongly recommend checking out the new book The $100 Startup by Chris Guillebeau. 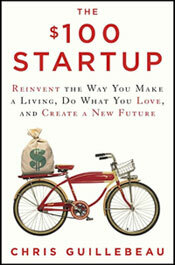 His book is an efficient blueprint for creating a job that helps you to achieve your vision of an uncluttered life. Before I started my writing career, I was afraid of all the things that could go wrong: What if no one wanted to read what I had to say? What if I never sold a single article? What if I hated writing from home and missed a traditional office environment? What if? What if? What if? Having fears about starting your own business or pursuing the career of your dreams is common. So are fears about finances and being able to pay the bills when your revenue stream is anything but certain. But if you’re ready to ditch a cluttered job or career and face your fears, Chris’ book can help with seasoned, practical advice and case studies of dozens of people who have done exactly what he recommends and succeeded. The book is rich with real-world wisdom, but my favorite part of the text relates to his recommendation to create a one-page business plan. If you can’t describe what you plan to do in a single page, you’re going to be slow to act and slow to find support for your idea. You need to know where you’re going and how you want to get there (just like with all things uncluttering related). In short, you should be able to explain your “product or service, a group of customers, and a way to get paid” in one page. If you have ever seen a business plan, almost all are notebook size and brimming with unclear business lingo and buzzwords. Chris advises you to abandon that and just get to the heart of what you want to do. Have a clear vision for your future. You can download or print a free copy of his one-page plan at 100startup.com if you’re interested in creating one for yourself. 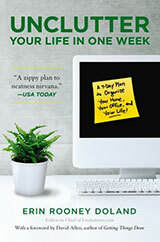 Are you frustrated, unproductively stressed, and miserable in your cluttered job? Are you ready for a change that will land you into an immersed career where you’re doing something you love or in a detached job that allows you to pursue your other interests freely outside of work hours? What’s keeping you from letting go of job clutter? Would a giant push in a new direction help you to finally let go of the job clutter? Would a book like Chris Guillebeau’s The $100 Startup help you to work through some of your fears, make a plan, and help you get on the path to an uncluttered work life? Speaking from experience, I can say I’ve found an uncluttered career worth the risk of making a change. 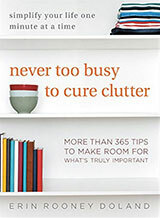 If you don’t like clutter in your home, do you really want it in your career? I was drowning in the what if’s of my small bussiness while waiting on the response of a new client. Then you reminded me of why I do it in the first place! What if I want an immersed career, but I don’t want to start a small business? Does the book apply to those who are just looking for a better job? I’m by no means an entrepreneur. That stuff stresses me out. @April — The book does address it, but not as thoroughly as starting a business/service/charity/etc. I liked Chris’ first book (The Art of NonConformity), which more directly addressed the immersed career where you work for someone else. Thanks for the recommendation on “The Art of Nonconformity”. My response is basically the same as April’s. I’ve seen the toll that trying to become an entrepreneur can take if you don’t have the right personality type for it. I appreciate and respect folks who do have an entrepreneurial personality, such as my boyfriend. But that’s not the kind of career that would be enjoyable for me, even if I could achieve professional success.